Brown Pundits: Where is My Family In the Media? Ever since the first Cheerios commercial last year showing an interracial family in a banal non-controversial context, there has been a lot of talk in the media about the topic. But one thing that has stood out in these treatments is a relatively narrow understanding of what interracial is. This is illustrated by an op-ed in The New York Times, Where Is My Family on TV? I looked up the various references to an interracial family/individual/relationship within the piece (I don't watch television, so many were unfamiliar to me), and every single instance except for the very last, pointing out Bruno Mars at the Superbowl, is of a black-white nature. The problem is illustrated by this pie chart produced by the Census: most interracial interaction in the United States is no longer black-white. About 20% of the people who chose more than one race on the 2010 Census selected black and white. When the original controversy over the first Cheerios ad occurred I remembered a Facebook share which featured interracial families. From what I saw ~80% were of the black-white variety. Perhaps this is the reflection of the background of the family in the Cheerios commercial, but it does get a little tiresome that a broad and general term like "interracial" gets totally specified in a way that excludes many people. To be fair, perhaps I am not being especially sensitive to the history of black-white relations in the United States. Though most minorities in this nation are no longer black, the vast majority were black until the 1965 immigration reform, and this remained the case up to the 1980s. America's history of race is to a great extent its history of black and white, and modern non-black minority consciousness is strongly influenced by this older template. 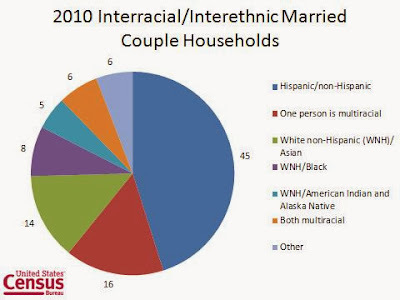 And to be honest I don't think of my own family as "interracial" very much, because in my own life race is not that big of a day to day factor. And, unlike the very cute actress in the Cheerios commercial my daughter is not visibly of mixed race*, so presumably her primary interaction with racial issues is going to be the small moments of surprise people feel when they realize that the brown-skinned man is her father. All this is likely related to the emergent reality of America's true race dynamic being that of a black/non-black divide. But if that is really what's going on here, we need to update it more explicitly. Too often the media seem to assume a world that is stuck in 1965, with a white majority and a black minority. We're nearly 50 years on from that. Our discourse should reflect that in some consistent manner. * It seems that people of mixed South Asian and European ancestry can look totally South Asian or European in appearance, with most in the middle. My daughter for whatever reason happens to be much closer to a European appearance.